3 Bedroom Semi Detached House For Sale in Blackpool for Asking Price £160,000. A spacious corner plot three bedroom semi detached house currently undergoing complete refurbishment due to be completed in around the next three to four weeks. 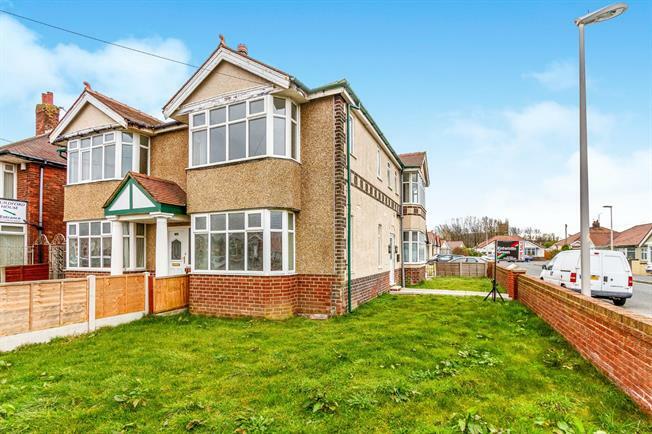 Once completed this property would make an ideal family with the accommodation to the ground floor comprising of a large entrance hallway, spacious living room and a modern fitted dining kitchen with centre island. There will be a stunning brand new three piece family bathroom with three good size bedrooms while the property benefits from UPVC double glazing, gas central heating, off road parking, large side garden and a private south facing rear garden. Composite double glazed door. Radiator, under stair storage, original coving. Double glazed uPVC window facing the front and side. Radiator, original coving. UPVC double glazed door. Double glazed uPVC window facing the side. Radiator, original coving, spotlights. Fitted, wall and base and island units, one and a half bowl sink, integrated, electric oven, integrated, gas hob, overhead extractor, space for standard dishwasher, space for washing machine. Double glazed uPVC window facing the front and side. Radiator, fitted wardrobes and built-in storage cupboard, original coving. Double glazed uPVC window facing the side. Radiator, original coving. The property boasts a large front and side garden area mainly laid to lawn with a flagged pathway leading to the entrance. To the rear of there is a driveway providing off road parking along with a private enclosed stoned south facing rear garden.